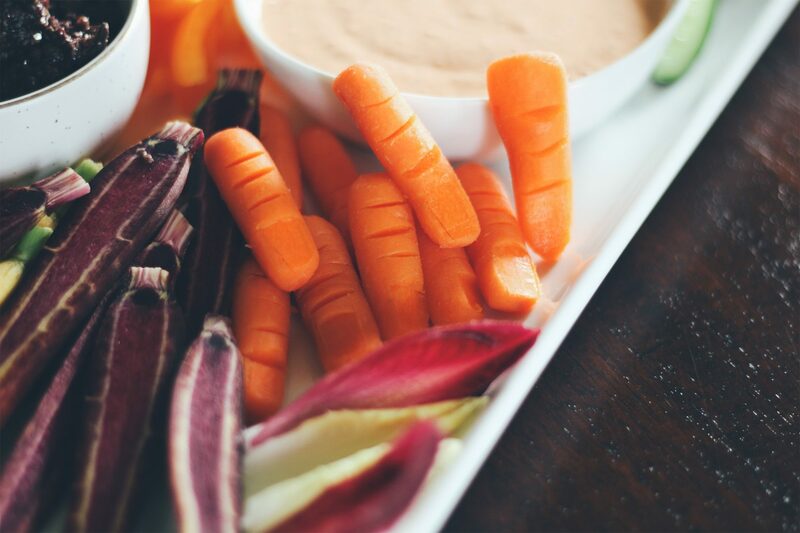 The crudite platter has come a long way since baby carrots and ranch dip. I have tons of tips for mastering the crudite platter below (think: textures, colors, seasonal ingredients, and surprising additions). 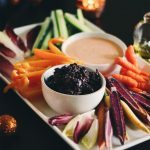 But for this post, I wanted to concentrate on a fun trick to turn a crudite platter into the easiest Halloween appetizer ever. There are so many fun and unique Halloween goodies for kids. But around this time of the year, I like to have a little shindig with friends. We watch scary movies, serve spiked punch, and there’s plenty of red wine. A lot of my friends have kids now, and this time of the year is usually the beginning of a very, very busy season for them. So this night is all about relaxing. Which means I don’t want to spend a crazy amount of time in the kitchen. I usually include a variety of fun, simple finger foods to munch on during movies and conversation. A crudite platter is one of my favorite things for this. Because, hello zero cooking. But just because it’s a grown-ups party, doesn’t mean it can’t include some Halloween fun! 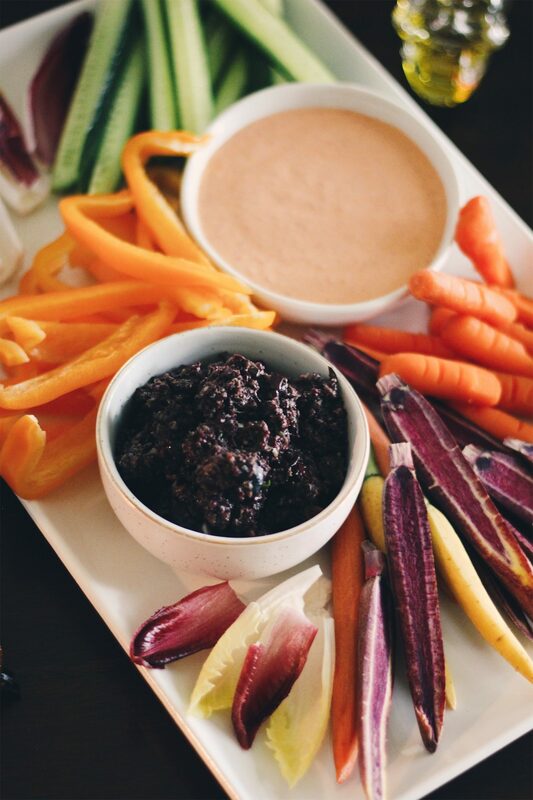 A basic crudite platter can easily be turned into Creepy Crudite with the help of black and orange dips (Black Olive Tapenade and Ricotta Roasted Red Pepper Dip), witchy carrot fingers, and sinister condiments served in skull-shaped apothecary jars. And the wine of the night? That’s easy. 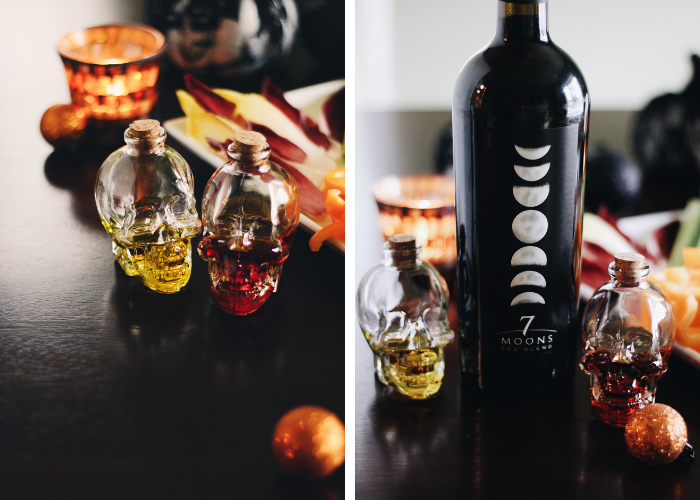 7 Moons Wines not only has the perfect label for a Halloween soiree, but it’s one of my absolute favorite wines. 7 Moons Red Blend is smooth, easy to drink, and I’ve never served it to anyone who didn’t love it. This wine celebrates the phases of the moon with seven unique grape varietals (Syrah, Merlot, Petite Sirah, Zinfandel, Cabernet Sauvignon, Malbec, and Grenache). Crafted in California, it’s fruity, versatile, and pairs wonderfully with food but also stands up on its own. Bonus: 7 Moons is also very affordable for the quality. Check out 7 Moons Wines and learn about the seven lunar phases here! We’ve got our wine and our Creepy Crudite. 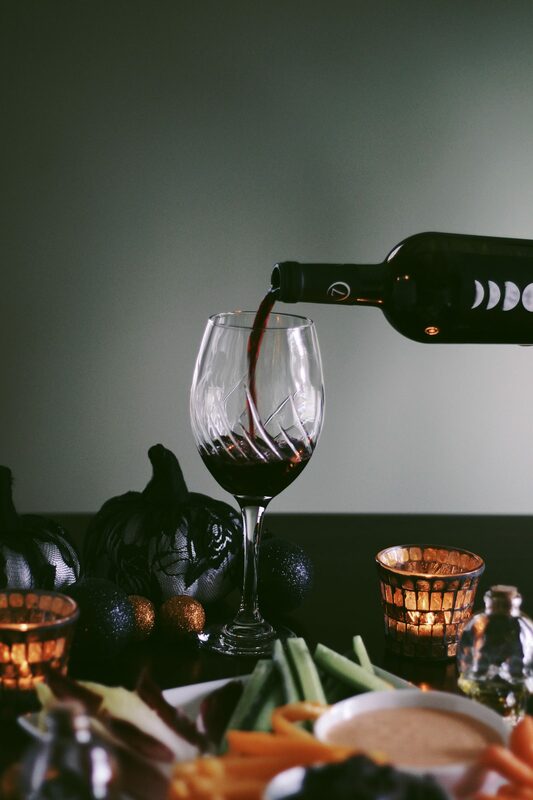 Add some candles, a few other finger foods, and your favorite scary movie, and you’ve got yourself a simple Halloween-themed night! What is in a crudite platter? Vegetables and dips. And that’s it! While crudite platters classically feature raw veggies, you can also feel free to experiment with roasting or grilling some of the vegetables. But one of the best—and easiest—things about a crudite platter is that it involves zero cooking. Use seasonal vegetables. The star of your crudite platter is the veggies, so try to showcase the very best that you can find. Shop your local farmers markets for inspiration! Crudite platters can appeal to most, as they are great for guests with diet restrictions. For example, the olive tapenade recipe below is vegan, gluten-free, dairy-free, low-carb, etc. Try to think about texture when you’re assembling a crudite platter. You should include crunchy veggies (carrots, peppers, cucumbers, radish), some leafy greens like endive, and softer veggies like roasted beets or butternut squash. Highlight a variety of colors in your crudite platter, too. Get creative with dips. 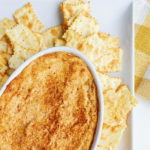 You can include hummus or bean dips, warm dips like spinach artichoke, cheese dips, and salty dips like tapenade. 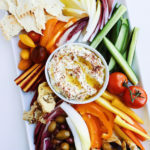 If you want to take your crudite platter next-level, include some special and unique additions like fried zucchini blossoms, fried tomatoes, pistachios, pickled vegetables, or some cheese and meats (marinated mozzarella balls, prosciutto-wrapped melon or avocado, etc.). 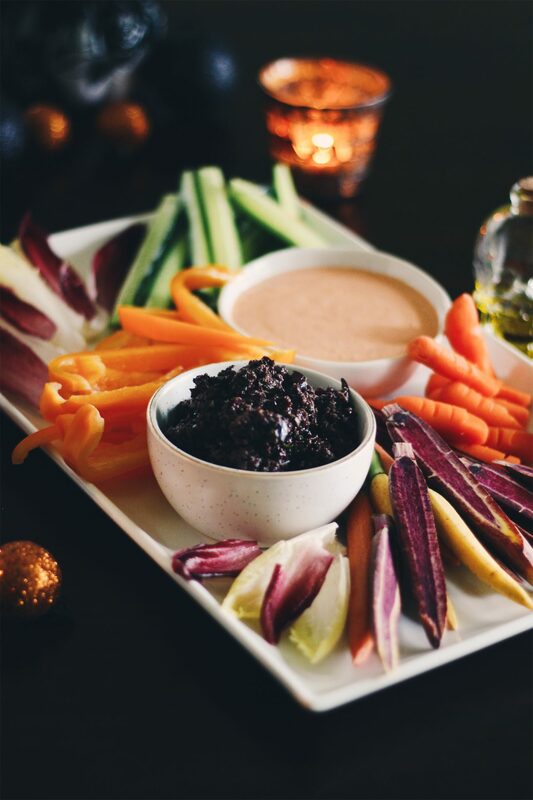 This Halloween appetizer includes easy-to-make black and orange dips of Black Olive Tapenade and creamy Ricotta Roasted Red Pepper Dip. Include some darker vegetables, like red endive, purple cauliflower, or deep purple carrots. 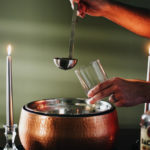 Place condiments like garlic-infused olive oil, red wine vinegar, or balsamic glaze in clear glass skull-shaped apothecary jars. 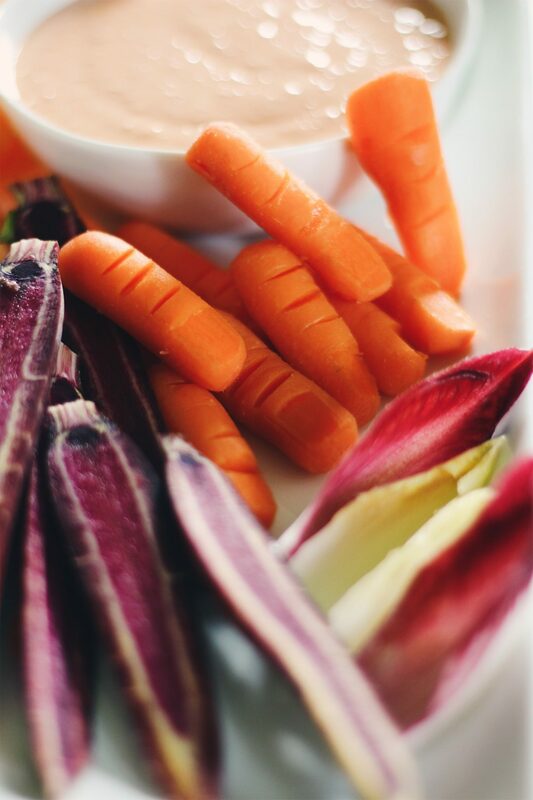 Turn baby carrots into witchy fingers in a snap. With a paring knife, carefully carve out lines for knuckles and a fingernail at the thinnest point of the carrot. I hope that you make and enjoy this Creepy Crudite Halloween Appetizer! What is your favorite way to creep-ify your Halloween festivities? Let us know in the comments below! 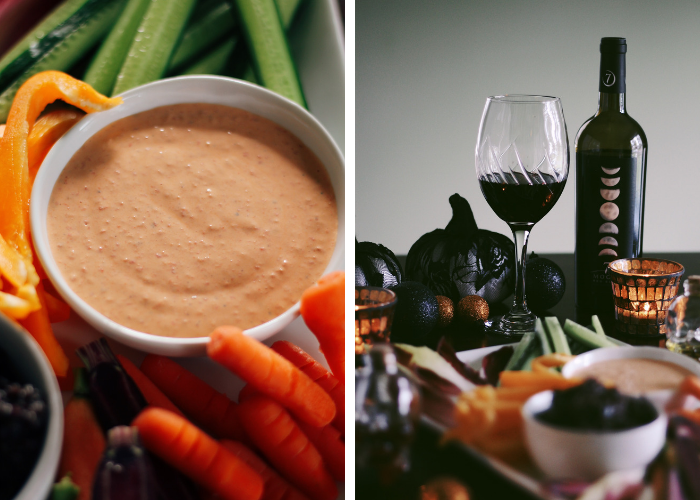 This Creepy Crudite with Black Olive Tapenade and Ricotta Roasted Red Pepper Dip is the perfect easy Halloween appetizer! Drain the roasted red peppers and let them dry out on a paper towel. Using a food processor, pulse the roasted red peppers with the garlic and olive oil until finely chopped. Season with sea salt and pepper. Add in the ricotta and cream cheese and process until smooth and creamy. Taste for seasoning and adjust. Using a food processor, pulse the olives, capers, and garlic until roughly chopped. Add the lemon juice, basil, and olive oil and process until finely chopped and combined. Taste and add salt and pepper if you’d like, but tapenade is usually salty enough on its own. Both of these dips can be made 1-2 days ahead of time and kept in the refrigerator until served. Love this platter! Wish I had seen it before Halloween – I would have done this for my son’s party! 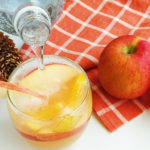 Your photos are gorgeous and fit this recipe so well. 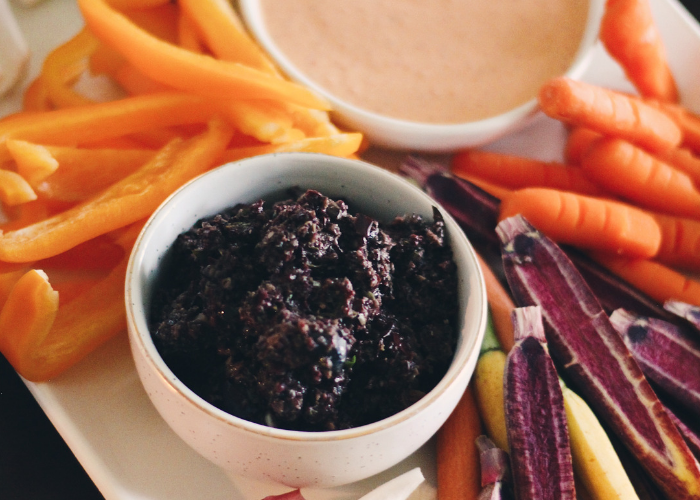 We all love vegetables and dip and the kids would even rather have it than chips and dip. I’ll have to try these next year. I have never heard of a crudite platter. I am sure no one would know what I was talking about – I would just say veggie platter. These look deliciously creepy. 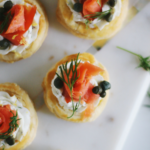 The perfect adult treat, especially when paired with a rich wine. That looks creepy and delicious. It really is perfect for Halloween! Oh my word those are so crazy looking! They really look like fingers! What a great idea! I love that it’s in the spirit of Halloween, and it’s also healthy! I love me a good crudité and I feel so fancy when I say it! And, wine is always a good choice! I have recently come to like the Syrah variety of wines. That 7 Moons sounds like they have a great selection. I’d like to try that Crudite. It sounds delicious! OMG These are hilarious. I love the carrot fingers. So funny. The wine is always a good choice.